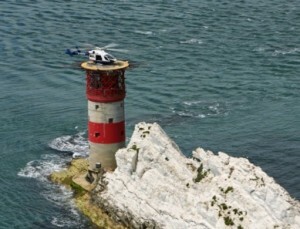 See what it’s like now..
A real feat of engineering, the lighthouse was built by Trinity House in 1859. It cost £20,000, an important sum in those days. The engineers used dynamite to create a platform in the rock, and to build a huge water tank, coal store and cellars. This meant that the lighthouse could still be manned when the weather was too bad for supplies to be sent out. Its circular granite tower walls are three feet thick at the base to withstand waves of up to 20 feet. There are five floors inside the tower. It has a light that can be seen 17 miles away and a powerful foghorn. The lighthouse originally had a staff of three keepers who kept a 24-hour watch during their month-long tour of duty. Conditions were basic, and in very bad weather the lighthouse keepers could be cut off for weeks at a time. They had to be prepared for the unexpected. One day the keeper was making a call on the telephone, 40 feet up, when a wave came through the window and washed his breakfast off the table.